At the group’s November 4, 2016 candidate forum, Youth for Change’s Jasmine Rios marks time, as Mariluz Tejeda, Azucena Barrios, and Jennifer Rios listen to responses. The question, carefully framed, is delivered in measured tones. Camera shutters click, news cameras roll in the background. The politician shifts briefly, eyes to his notes. This is not, however, Capitol Hill. It’s Friday night, three days before the 2016 election, in the Labor Council building on the east side of Salinas, a working-class agricultural city of 150,000 on California’s Central Coast. The room is full, and mayoral and city council candidates are ready for questions. Asking the question is Mariluz Tejeda, 15, of Youth for Change, a new youth group organized in Salinas by the Center for Community Advocacy (CCA). Beside her are Jennifer Rios and Azucena Barrios, both 19. A junior at Salinas High School, Tejeda has a serious demeanor and intellectual pursuits to match – math, coding, and Japanese. Her parents are immigrants from Mexico. “I’m a youth resident leader of Acosta Plaza,” Tejeda begins, referring to the densely-populated complex of 305 condominiums on the east side of Salinas. She then proceeds with confidence, delivering the group’s next question to the candidates about their future commitments to the community. It’s a safe bet that six months before none of the youth conducting this political forum dreamed they’d be shaping the dialogue this way. 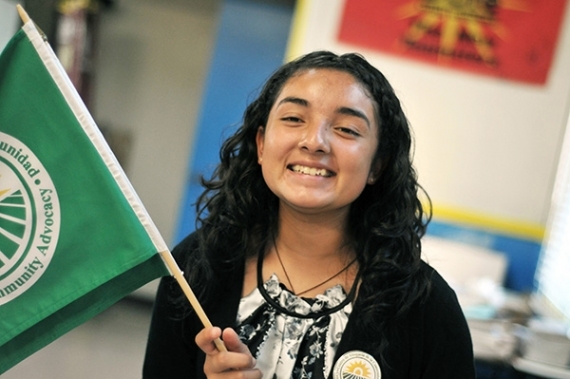 Juana Hernandez of CCA’s Youth for Change greets attendees with a smile at the group’s non-partisan candidate forum on November 4, 2016. Nor could they have foreseen that just three months later, in part due to their efforts, a press conference would celebrate their collaboration with residents and local partners to purchase property for a local community center. A youth program is a new venture for CCA, an institution dedicated to developing and sustaining neighborhood-based leadership in farmworker communities in California. But it is by no means a stretch. There are seven high schools in Salinas, and the median age in town is just 28. Back in 2014, CCA Lead Organizer Joel Hernandez began recruiting for Youth for Change the hard way, distributing flyers at a bus stop near La Paz Park, in East Salinas. CCA’s organizing team engaged youth with cleanups, door-to-door campaigns, and traditional gatherings like Christmas “posadas” and Day of the Child celebrations. For participating in these efforts, volunteers received community service hours, required by local high schools to graduate. Successful events helped Youth for Change spread the word. When members of the group joined other youth and parent residents helping advocate for Acosta Plaza’s basketball court and recreation area, Hernandez knew they had started something significant. From the beginning, young people led the way by expressing ideas. They then took initiative, building actions and bringing their original thoughts to life. Interest in how government works led to two successful campaigns by Youth for Change, both non-partisan efforts. The first of these, a voter-registration drive in a targeted East Salinas precinct, led to a ten-percent increase in that precinct’s turnout. The second, the political forum, was a real achievement in leadership for its young organizers. 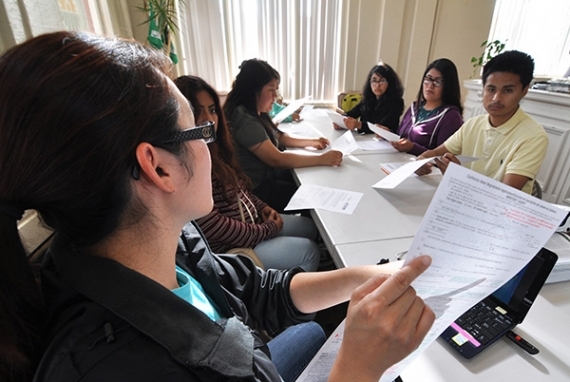 At CCA’s headquarters in Oldtown Salinas, Mary Kikuchi of the Monterey County Elections Office conducts voter registration training for Youth for Change members. Azucena Barrios was in high school and a member of a local youth leadership group, Alvarez Youth Leaders, when she met Hernandez at Acosta Plaza. She has volunteered with CCA ever since. Now studying political science at Hartnell College, she is determined to become an immigration lawyer, and return to Salinas. For anyone, speaking out takes courage, so it really helps that Youth for Change feels like family. “I never knew I could speak in front of people,” says Belén Calderon, 16, a resident of Acosta Plaza. She is a new member of Youth for Change who has blossomed in the group setting. What’s next for Youth for Change? Keeping its members’ concerns in mind, the group is helping CCA develop a curriculum that illustrates pathways to higher education. In collaboration with various programs in Salinas, the idea is to construct a simple resource that any student and parent can use to plan options. Hernandez is happy with the progress the group has made in the last year. 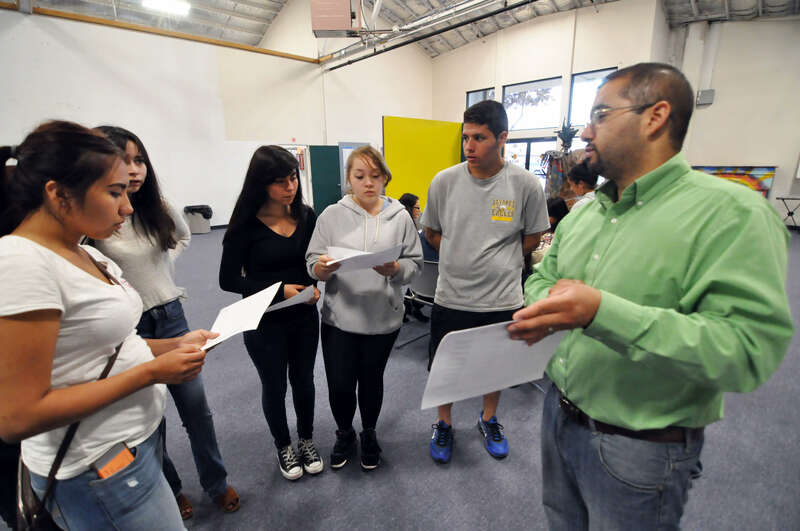 At a meeting in early September 2016 with Joel Hernandez of the Center for Community Advocacy, members of Youth for Change develop a plan for walking precincts in East Salinas.